Jane Toppan was born Honora Kelley, daughter of Irish immigrants by the names of Peter and Bridget Kelley. Unfortunately for her, when she was just a few years old, her mother died of tuberculosis, leaving her in the care of her alcoholic and allegedly abusive father. Accounts are conflicting as to whether Peter Kelley, who was nicknamed around town “Kelley the Crack”- short for crackpot- owing to being considered a little loopy, then proceeded to raise Honora and her two older sisters, Delia and Nellie, himself, or left them in the care of their grandmother. Either way, a few years after their mother’s death, whether because he simply didn’t want to raise them anymore or because he thought they’d have a chance at a better life if he gave them up, he carted the six year old Honora and eight year old Delia off to the the Boston Female Asylum orphanage in 1863. As for Peter, who appears to have been a tailor or tailor’s assistant of some sort, he went his separate ways from the girls and never saw them again. It’s not clear why he chose to keep his oldest daughter, Nellie, or even precisely whether she actually existed at all. The story of Nellie only came about later when a supposed cousin claimed Honora had an older sister named such that went insane and was committed to an asylum in her 20s. Whatever the case, just to quickly wrap up Peter’s story, records are scant, so it’s difficult to definitively determine what happened to him, but rumor has it he became increasingly unstable over the years. Further, whether true or not isn’t clear, he supposedly eventually sewed his own eyelids shut and was subsequently put in an asylum. Efforts on our part to find a contemporary, first-hand account of this failed, so we’ll leave it to you to determine whether this was true or not. Going back to Honora and Delia, Delia appears to have ultimately become a prostitute and nothing is known about her after that. This all brings us around to Honora. She stayed at the orphanage for two years with little known about her time there until she was placed in the Toppan household in Lowell, Massachusetts under the care of Abner and Ann Toppan. In return for her services until she was 18, she was provided room, board, an education, and promised payment of $50 (about $1300 today) once her service was up. Accounts are conflicting on whether Honora was ever adopted by the Toppan’s, but there doesn’t appear to be any record of such. That said, she did have her name legally changed to Jane Toppan. While with the family, she functioned as a servant and also a companion to the Toppan’s daughter, Elizabeth. By newspaper accounts from her trial and after she died, Toppan supposedly was an extremely intelligent girl, did well in school, and other than being known as something of a frequent liar, had little trouble making friends and was well liked. Once graduated from high school, the Toppan’s dutifully released Jane from her indentured servitude, paid her the promised $50, and immediately hired her on as a servant to continue her former job, which she did for about a decade. 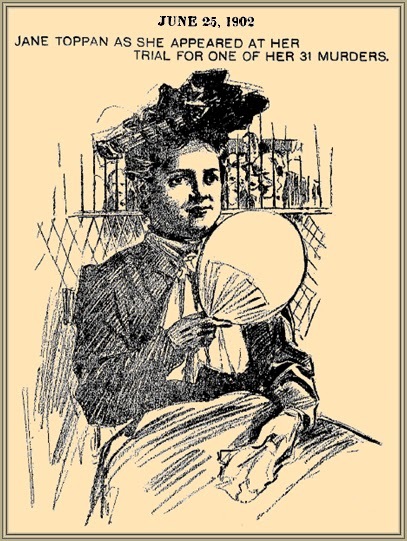 Ultimately Mrs. Ann Toppan passed away, but Jane was able to retain her position as servant for Elizabeth, who soon after would marry one Oramel Brigham- a church deacon. It’s not clear why Jane eventually left the Toppan house, and it is known that she and Elizabeth remained on friendly terms even after she left, She was also welcomed back for visits whenever she liked; so it doesn’t appeared she was forced to leave. This is much better than the moniker she would be given later- “The Nightmare Nurse”. It’s not clear when Toppan began toying with and murdering patients, but at some point in here she began experimenting with administering various levels of certain drugs on patients she became particularly close to- mostly favoring elderly patients and those who it wouldn’t seem suspicious if they died anyway. It appears once she targeted a patient, she would give them doses of certain drugs to keep them ill. This ensured they’d stay in the hospital. She would then progress to giving them various doses of other things to observe the effect, eventually seeming to favor alternating morphine and atropine, both for the resulting effects and that the pair together helped mask symptoms that would otherwise make it obvious to doctors what was happening to the patient. Not just intending to murder them outright, Toppan seemed keen on prolonging the experience for herself, later noting she enjoyed bringing them to the edge of death, then back again. Unfortunately for some, she would eventually decide to administer a fatal dose, apparently particularly enjoying crawling into bed with them to hold them as they died. In one account of a surviving patient, one Amelia Phinney, she described Toppan giving her some unknown drug after Phinney underwent an operation. Not long after taking the drug, Phinney lost consciousness, but later vaguely remembered Toppan in bed with her kissing her around her face, before suddenly jumping out of bed and fleeing the room when someone was heard walking by. Feeling better the next day, Phinney checked out of the hospital. At the time, she dismissed the experience as a hallucination or dream brought on by the drugs she was given, but later when Toppan’s story was making headlines across the nation, she decided maybe it had actually happened after all. All didn’t go unnoticed by her coworkers, however. It’s noted that some doctors and nurses became disturbed by Toppan’s seeming obsession with autopsies, and some of her coworkers also suspected she’d been stealing from the hospital and patients. However, she was extremely charismatic and otherwise excellent at her job when not toying with her patients. As such, she was very popular among said patients- in fact, in reading over her later trial notes from former patients and witnesses to her providing care for those she was slowly killing, she did indeed outwardly sound like a phenomenal and caring nurse. This facade all saw her in 1889 get a position at the Massachusetts General Hospital, where she murdered several more people in her trademark way. She only lasted a year here, however. Accounts are conflicting on why she was fired, but it would appear she simply broke some hospital rules, particularly leaving without permission, and was summarily dismissed. After this, she briefly worked as a private nurse before once again getting a position at Cambridge, but was fired from there in short order after being chastised several times for “accidentally” giving incorrect dosages of various medications. Nevertheless, as she was otherwise a great nurse and there were various doctors and patients (who she didn’t kill) who sung her praises, she initially had little trouble finding work outside the hospitals, moving on to, again, working as a private nurse and caretaker. It is here that Jane Toppan went on something of a much easier to track accurately murder spree. To begin with, when upset with her landlord in 1895, Israel Dunham, she decided to kill him and then, after moving in with his widow to work as a servant, two years later killed her too. As to why, she would later state because they were “old and cranky”. Fast-forwarding to 1899, her foster sister Elizabeth was feeling a bit depressed, so Jane decided to go out for a picnic with her, preparing the food herself. Unfortunately for Elizabeth, Jane had put a healthy dose of strychnine in the water she brought for Jane to drink. Over the course of the following week, she outwardly attempted to nurse Elizabeth back to health, but in fact was variously bringing her close to death and back again as she saw fit. Eventually, she finished the job. Her motivations for killing Elizabeth appear to have been both jealousy of Elizabeth’s beauty and the fact that she’d managed to find a good husband in Oramel, which Jane would pursue herself once Elizabeth was out of the way. She also managed to turn a small profit in the killing of Elizabeth by telling Oramel that on her deathbed Elizabeth had told Jane she wanted her to have Elizabeth’s gold pocket watch and chain. After receiving these from Oramel, she promptly sold them. Next up, Jane secured a job carrying for an elderly Mary McLear, not long after killing her in late 1899. It is likewise thought she stole various items from McLear before departing from that job. A couple months later, her job prospects were helped by murdering one of her friends, Myra Conners, in order to take her job as a dining hall worker at a place called The Theological School. Telling the dean of the school she was well acquainted with her dear departed friend’s job, she was hired, though it quickly became clear she had no clue what she was supposed to be doing and her subordinates loathed her. Several months later she was fired as complaints from her fellow workers piled up and it was suspected that she was stealing money from the school. Next up, in 1901 she simultaneously poisoned, Melvin and Eliza Beedle, to make them ill, and then gave their housekeeper something to make her appear like she was intoxicated, in hopes said housekeeper would be fired and Jane would get the job. The scheme worked and she once again found herself gainfully employed. Lucky for the Beedle’s, later in 1901, one Mary “Mattie” Davis came a knockin’ to collect a whopping $500 in owed rent (about $15,000 today) from Toppan, who was at the time living in a cottage of theirs. It turns out, Jane slipped Mattie some poison or other in mineral water, then when Mattie fell ill that evening, gave her healthy dose of morphine to make her feel better. Demonstrating remarkable skill at murdering people, doctors, who should otherwise have easily been able to diagnose an overdose of morphine and many poisons, closely watched over Mattie for the next week but were none the wiser to what was happening right under their noses. Finally, Jane finished her off, with Mattie Davis dying on July 5, 1901. The 64 year old Alden Davis was thus in need of someone to take over his former wife’s duties around the house and Jane owed him a rather large sum of money, so he hired her on. Not long after, mysteriously at several points over the course of a week the Davis house had various parts of the home burst into flames, but in each instance the fire was extinguished before any major damage could be done. It is speculated that Jane was perhaps trying to destroy records of her debt to the Davis’ as one of the fires occurred in a closet full of documents. Better for them had she succeeded if that is what was happening. Whatever the case, Jane’s next victim was Alden’s daughter, Genevieve, who she killed on July 26th. To try to shift any suspicion away from herself, Jane speculated that Genevieve had become so depressed at the sudden death of her mother that she killed herself. On August 8th, Alden suddenly died, supposedly suffering a stroke- no doubt brought on by stress and heartache after the death of his wife and youngest daughter. On the night of August 12th or morning of the 13th, the remaining daughter of Alden’s, “Minnie” Gibbs, inexplicably died. Again, it’s speculated Jane’s motive here was to try to get rid of the large debt she owed the family. Whatever the case, after Toppan slipped her the killing drugs, she then took Minnie’s 10 year old son to her bed, apparently to comfort him while his mother lay dying, though it’s not actually clear what occurred while she slept with him that night. While no one at this point had made the connection between Toppan and the various deaths that seem to follow her around, an otherwise in good healthy family almost entirely up and dying in short order raised some eyebrows with the authorities, and they began to suspect Toppan may have been involved. Now back to her ambitions to marry Oramel. With her debt problem settled, she set her sights on settling down. But first, she had to get rid of Edna Bannister, Oramel’s sister, who she thought would be an obstacle to her plan. The problem was it turned out Oramel himself was a bigger obstacle, uninterested in Jane at all. Naturally, Jane then poisoned him, but not so much as to kill him- after all, she wanted to marry him. Once he was ill, she offered her services as a nurse, which he accepted. After he was better, he once again rejected her advances to take their relationship to the next level. Not giving up yet, some accounts claim Jane then said she was pregnant by Oramel, at which point he threw her out of the house. Other accounts claim she didn’t get kicked out until she attempted to kill herself- or, at least, make it look like she was attempting such. Given her extensive knowledge of the dosage needed to kill someone with morphine, it seems likely that when she purportedly attempted to kill herself from overdosing on that drug, she may have more been looking for some sympathy. Whatever the case, she recovered just fine in the hospital and was indeed no longer a resident at the Oramel household once released from the hospital. While all this was going on, an investigation was under way over all the deaths in the Davis family. Authorities had a breakthrough when Minnie Gibb’s father in law hired a toxicologist by the name of Leonard Wood to examine the bodies of the Davis family. After he did so, it was determined that, indeed, they had been poisoned. At the same time this was happening, as mentioned, Jane found herself without a place to stay and having read in the newspapers about the exhuming of the Davis family, naturally, she skipped town- going to visit a friend, Sarah Nichols, who lived in New Hampshire. Unfortunately for her, the police had already assigned a detective, one John Patterson, to clandestinely following Jane’s movements, so they knew exactly where she’d gone. 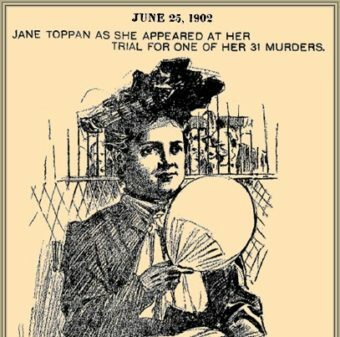 Once there was evidence the family had been murdered, Jane Toppan was finally arrested on October 29, 1901, while still in New Hampshire. Demonstrating her uncanny charm, it’s noted that Jane soon made a great friend of the warden of the jail’s wife, who became thoroughly convinced Jane was completely innocent. Now, while you might think this would be a cut and dry case, it turns out it wasn’t. You see, at first the prosecution put forth that Jane had killed the Davis’s using arsenic, as large amounts of that substance were found in their bodies. The problem was, she hadn’t killed them with arsenic at all- that arsenic was introduced as part of the embalming process. When this was revealed, deflated, the prosecution and their doctors were flummoxed. It was then suggested that perhaps she’d used morphine in combination with atropine, to mask the telltale symptoms of morphine overdose. During the trial, the doctors interviewed deemed that this could indeed have been how she murdered them and that, taking that into account (something they’d not before considered), the symptoms observed when the Davis’ had been dying did indeed match what would be expected there. In the end, Toppan would go on to explicitly confess to 11 murders, though would later confess to her lawyer that the real figure was 31. Later recanting again, she claimed the actual figure was much higher, though given she was known as something of a pathological liar, it’s difficult to determine the truth in any of this. Other than Toppan’s account, however, there is no record of any such man, and it would later appear as if her plan here was to get declared insane, so as to be sent to an asylum instead of prison and potential execution. It’s then speculated that she planned to use this jilted lover tale to garner sympathy and demonstrate that she wasn’t inherently insane- thus perhaps able to later charm her way out of the asylum. I feel absolutely the same as I always have been. I might say I feel hilarious, but perhaps that expresses it too strongly. I do not know the feeling of fear and I do not know the feeling of remorse, although I understand perfectly what these words mean. Now I cannot sense them at all. I do not seem to be able to realize the awfulness of the things I have done, though I realize very well what those awful things are. I try to picture it by saying to myself, ‘I have poisoned Mary, my dear friend; I have poisoned Mrs. Gibbs, I have poisoned Mr. Davis, but I seem incapable to realize the awfulness of it. Why don’t I feel sorry and grieve over it? I don’t know. I seem to have a sort of paralysis of thought and reason. Her “hilarious” or joyful state (the word didn’t come to mean “extremely amusing” until a couple decades after she said this) didn’t last, however. She seems to have initially thought she’d be able to charm her way out of the asylum- convincing the physicians there that she was perfectly sane and no longer a threat to society. The result of those examinations was that I reached the opinion that the defendant was insane and irresponsible for the crimes for which she is charged; that she was suffering from a form of degenerative insanity characterized by the absence of moral sense, by defective control and by an irresistible impulse to the commission of extreme crimes… [Her condition] is constitutional, probably hereditary, confirmed, and renders such a person always dangerous and a menace to society if at large. And so it was that as the years passed with no prospect of getting out of the asylum, Jane’s mental state really did deteriorate. Dear: I am the victim of nerve paralysis, the result of food. I have to eat or I am fed with a tube with nerve-paralyzing food that I choose from the tray. Oh, I think that you and – were criminals to put me through this. It was an awful thing to do any human being, and I have my opinion of everybody who takes a hand in it. I think it has been a noble piece of work. I think as the nerves of my body get more benumbed my brain becomes clearer to the outrageous course that has been taken with me. I suppose the next thing, something will be given to put me out of the way altogether. That would be a mercy too. Despite her reported state, she lived for over three decades more, dying at the age of either 81 in 1938.